Alongside the launch of the Ryzen 3 1300X and Ryzen 3 1200, AMD also started to make its Threadripper processors available in pre-built machines. The Tech Report compiled what looks to be a thorough list of systems that became available packing these powerful HEDT CPUs yesterday. Separate processors and motherboards won't be available until 'early August'. However, some sort of veil appears to have been lifted, as yesterday well known OC expert der8auer took to his YouTube channel to delid one of these shiny new CPUs. Vendors hawking new Threadripper systems include the likes of; CyberPowerPC, Dell / Alienware, iBuyPower, and Velocity Micro. Several of these brands won't appear this side of the Atlantic, however the Alienware machines are likely to be distributed worldwide and luckily those are thoroughly detailed on the Dell website. 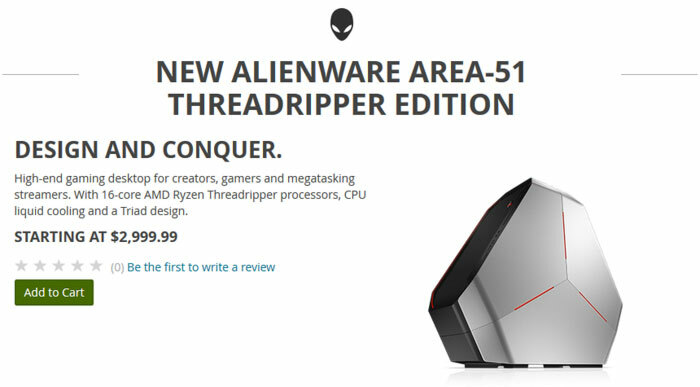 I looked at the UK version of the Dell/Alienware site but all the Area-51 systems I saw were Intel-based. Dell uses either the 12C/24T 1920X or 16C/32T 1950X CPU in its Threadripper machines. These are paired with 8GB or more DDR4 RAM, and come with Nvidia GeForce GTX 1060 or better GPUs, and Windows 10. Dell can fit up to 64GB of RAM, up to a pair of GTX 1080 Ti cards, and up to 1TB SSD/2TB HDD storage. As mentioned in the intro to build your own AMD Threadripper system you will have to wait for CPU and motherboard availability in early August. Overclocker der8auer has already delidded one of AMD's new Threadripper processors. As he was away from home he didn't have access to his usual delidding gear, particularly a heating element he has designed. So in the video you see him tackle an innocent Threadripper with a multitude of razor blades and a pair of hot hair soldering guns. 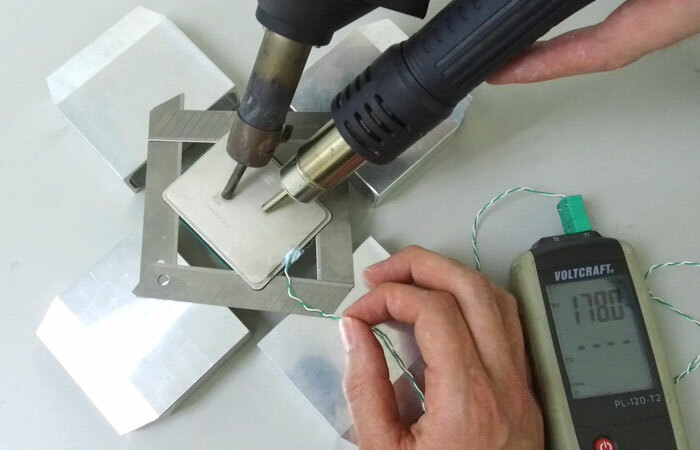 The lid didn't just 'pop off' as expected when the temperatures edged towards 180 degrees (a little above the melting point of Indium solder) and der8auer was worried about overheating the chip and damaging it. In the end a bit of pressure from above plus the pressure of razer blades supported from each corner, to work as levers, did the job. Surprise… AMD Threadripper hides four dies under the lid, while der8auer was expecting just two. The discovery leads to the question of how AMD has activated/deactivated certain parts of its Epyc chips to create the Threadripper range. Unfortunately a cunning plan to use temperature probes on each of the four dyes on the reanimated chip came to nothing as when powered on the chip failed - 'pop'. 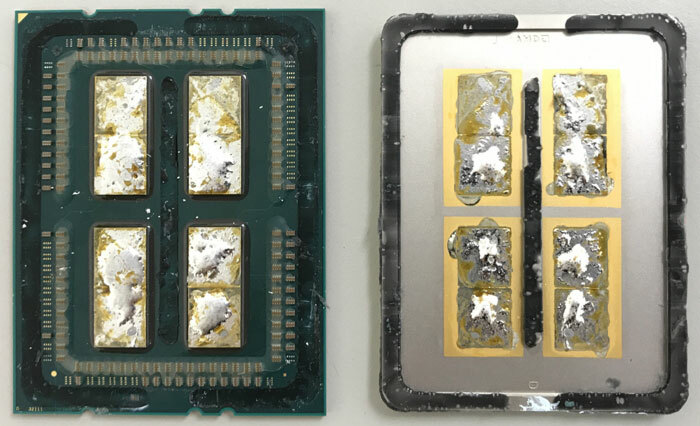 It is thought that the delidding process and exertion must have damaged a chip component or two. A call to AMD provided the answer anyway. The firm said that in the 16C/32T chip under test two of the four dies were completely unused. Hope that this design decision doesn't impact thermals or power too much. two of the four dyes are completely unused? Then why leave them there? Can they be activated like the old dual-core to three-core athlon XPs? I mean the TDP would go through the roof but is this a signal that they have further to go if they need to, and provided people smack on some serious cooling solutions? I've read that 2 of them aren't true dies at all, they are effectively just spacers to keep the IHS flat and in good contact. So no unlocking or impact on thermals. As long as it doesn't undermine thermals or other similar areas then no problem. However it is odd, if the dies aren't even dies at all, why are they there in the first place as “holders”? It's highly likely that AMD has done this because they want to continue this platform further so this first run are 2 die only TR CPUs but in Zen+ maybe we'll see a 4 die TR CPU and EPYC will jump another die number threshold? .. and EPYC will jump another die number threshold?